From the trendy to the charming, Barbados delights with its wealth of contrasts. A flat coral island, its landscape is dotted with rolling hills. The island's friendly, laidback atmosphere enjoys touches of glamour and sophistication, while its bustling cities are surrounded by cozy pink cottages, blue lagoons and coconut groves. Often referred to as "the little England of the Caribbean," the island's language, lifestyle and architecture reflect its rich British heritage. The Garrison area near Bridgetown, a UNESCO World Heritage Site, is a must-see for history buffs. Visitors might also attend a polo match, discover the story of the island's renowned rum, dine on flavorful Caribbean delicacies, stroll powdery beaches, or dance away nights to the swaying rhythms of a calypso band. 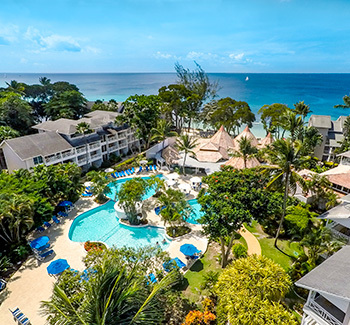 The Club, Barbados Resort & Spa is the ultimate All-Inclusive resort for adults seeking an authentic Caribbean experience. This chic oceanfront resort exudes the signature warm hospitality of Barbados. Catering to couples and newlyweds, its comfortable accommodations, tropical gardens, enriching activities, delectable restaurants and cozy bars set the stage for relaxation and finding your bliss.